Peel the chayotes, and cut into 1/4-inch slices. Steam for about 20 minutes (or until soft, but still firm enough to hold their shape well). Let them cool for 10 minutes. 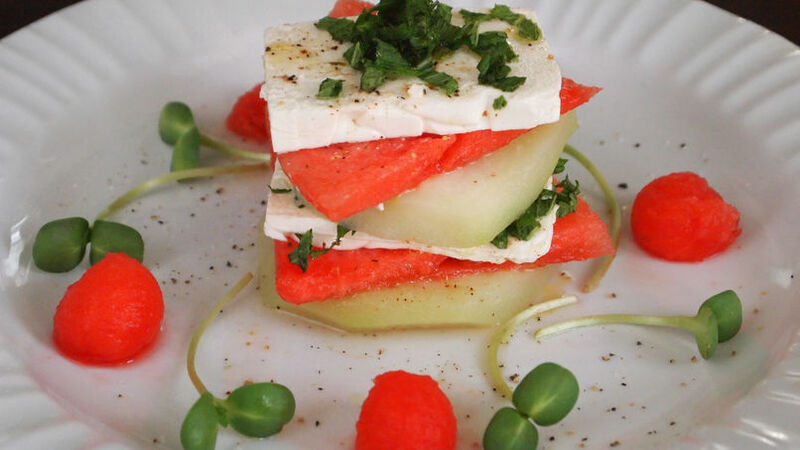 On a plate, place a slice of chayote, then a slice of watermelon, and top with a slice of cheese. Sprinkle with salt and pepper to taste, 1 teaspoon olive oil, a squeeze of lemon, and 1 teaspoon chopped mint. Repeat the previous steps. By the end you should have 6 slices, one on top of the other. Serve immediately. You can replace the chayote squash with zucchini or summer squash. For a sweeter version, replace it with melon. Who doesn’t love a cold slice of watermelon in the summer? In every crunchy bite, so much water and sweetness bursts out of this revitalizing fruit that it almost makes drinking anything else irrelevant. For a long time now, I had been looking forward to putting the colorful summer fruit together with one of my favorite “exotic” vegetables: chayote squash. This ingredient is quite common in Latin America, and I’m very happy that I can still find it at my local supermarket in New York, almost year round. Its taste is very mild, almost sweet, and its texture soft and incredibly watery–as much as a watermelon. I knew the pairing would be good, but the result of this dish exceeded my expectations. These two super hydrating foods are a match made in heaven for hot summer days. Just add some feta cheese to give it a savory kick and get ready to enjoy an exquisite appetizer that may turn into a regular at your kitchen.